A megacity is defined by a population of 10 million people and the number of megacities has grown to 31 in 2016. 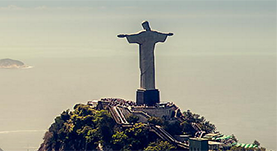 Rio de Janeiro is the 20th largest city in the World 2016 with a population of 12 981 000. The annual growth rate is 0.9% and it is 6.3% of the population in Brazil. São Paulo is the biggest city in Brazil 2016 with a population of 21,297,000 people. The largest city in the World is currently Tokyo with 38,140,000 residents. « Rio hoped for a post-Olympics boom. Instead, its crisis is getting worse.